Support USB interface power supply and direct use of power-bank power supply or USB computer power supply. Support PH2.0 interface power supply and the battery box or lithium battery power supply are both OK.
Leaded out P0 and P1 interfaces, and distribute with the connection line, support the boson expansion modules. Ultra-thin volume,more suitable for wearable and strap applications. Note: After uploading the micro: bit program you need to connect the USB cable to the expansion board for power, You can also use 3.5-5.0 V power supply to power from the expansion board battery! 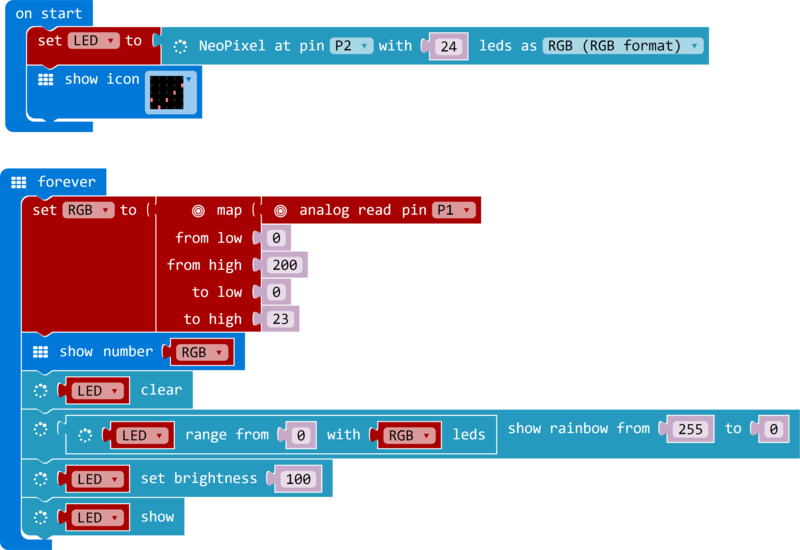 Preparation work, add the neopixel software package, in other words, loading the lamp ring library; the steps are as follows. 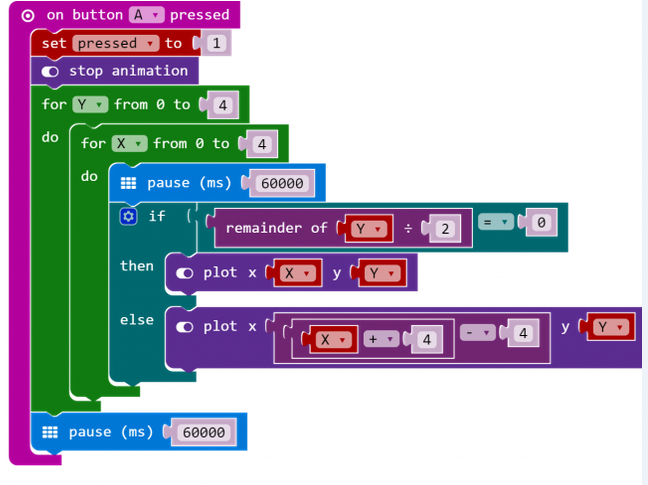 Modify to solid color rotation effect Click and enter the graphic programming：Yellow Rotating Circular Light Modify the color behind the show color to get other solid color rotation effects. 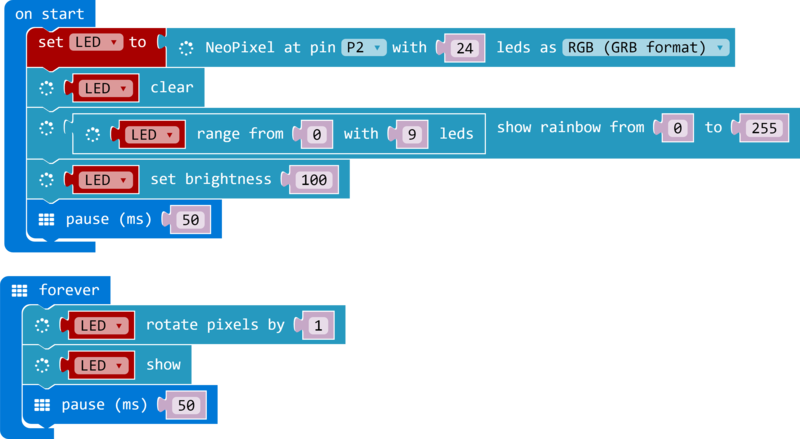 Click and enter the graphic programming: The Graphical Programming of Voice Control Circular Light '''Effect: ''' Light up 24 RGB LEDs in sequence according to the size of the detected sound, forming a gradual pulsating light ring. By modifying the "Map" to change the relationship between sound intensity and the number of alight leds. 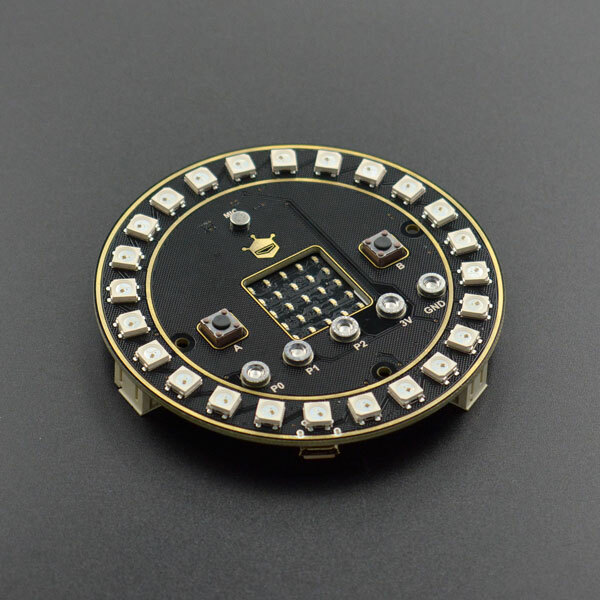 0~300 represents the range of sound; 0~23 represents 24 RGB LEDs. 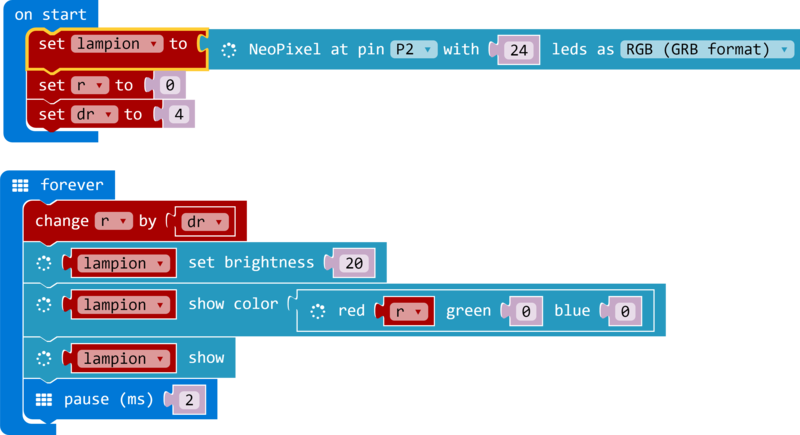 Click and enter the graphic programming:Breathing Light '''Effect: ''' 24 RGB LEDs light up red at the same time, the brightness changes from weak to strong in loop, like breathing. The Pomodoro technique is a simple time management method. Essentially, it is to set a 25-minute work period and do only one thing in this period. So this is a 25 mins timer. 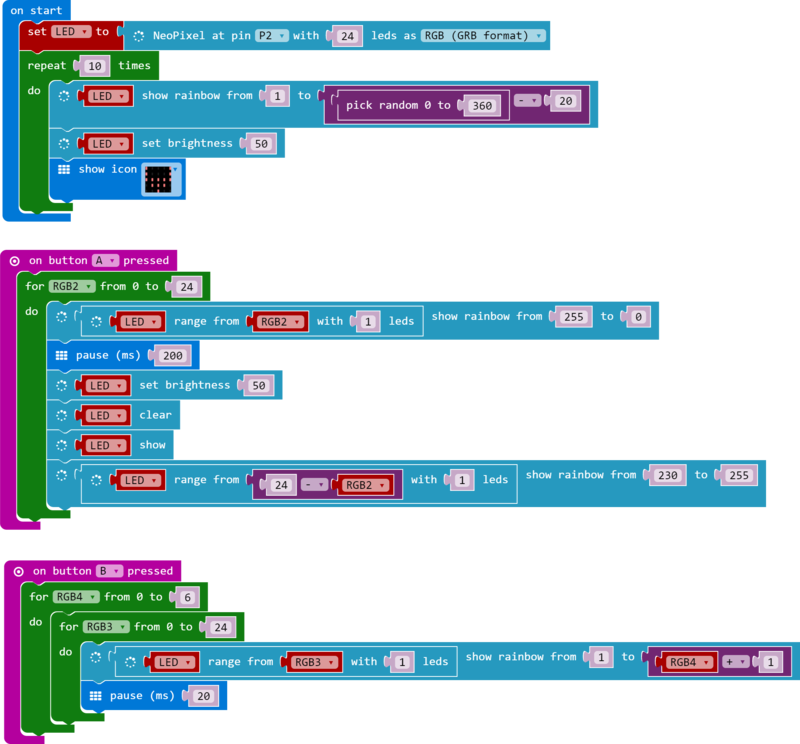 Click and enter the graphic programming:Tomato Timer '''Effect: ''' Press key A to start the program and light a LED on the main board in every minute. 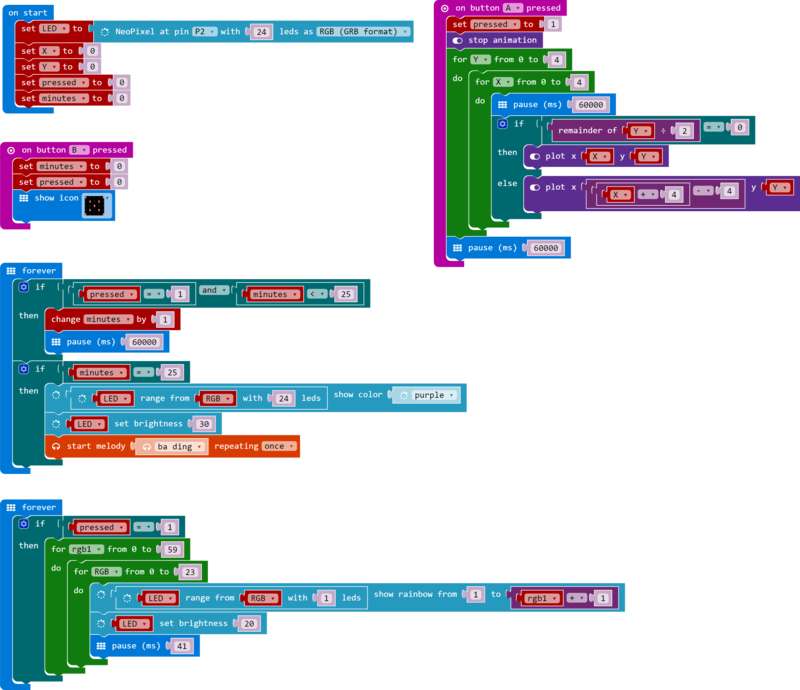 When all LEDs are on, the buzzer beeps; When key B is pressed, stops the buzzer and stops timing. The circular light refreshes the color in every second. Execution Process: Firstly, define some variables. Such as "X", "Y", "pressed", "minutes". 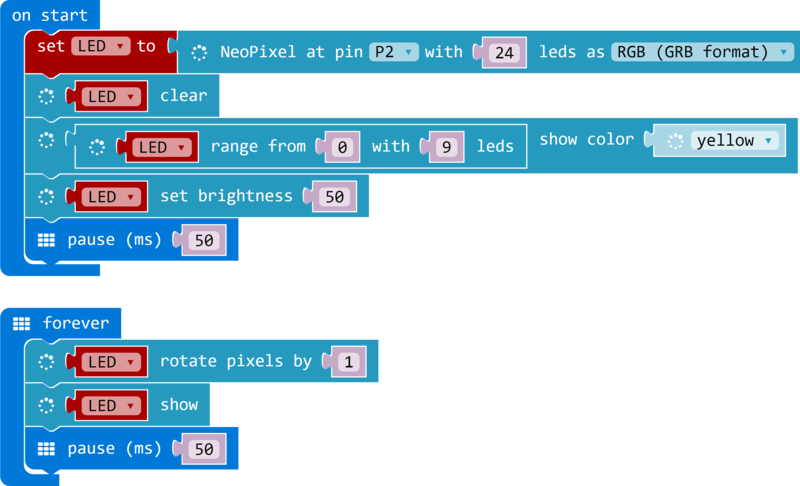 Where "X" and "Y" are the LED dot matrix coordinates of the micro:bit board. Set Time Minutes<25;minutes 1; When minutes=25, the buzzer rings; Set the effect of circular light When key A is pressed, start the circular light program; refresh the color in every second. Calculation formula for the time interval between each RGB LED: 6000ms (1min) / 24 (24 RGB LEDs) / 60 (repeat 60 times) ≈41ms. Q: Why sometimes the light is partially lighted/ the brightness is low when the sample code is uploaded? A: The light ring requires a high power supply. So you need to connect the USB cable or the external battery to power port(USB/ external battery) of the expansion board. 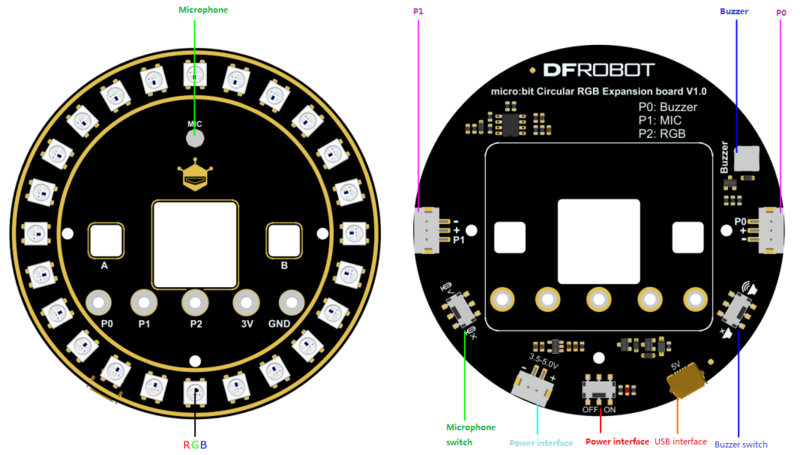 Get Micro:bit Circular RGB LED Expansion Board from DFRobot Store or DFRobot Distributor.